A thrilling novel of diamonds, deceit and a trip up-river to Marlow’s Landing. Toby Vieira was born in New Delhi and has lived and worked in the UK, France, Switzerland and Belgium. He has in the past taken a close professional interest in precious stones, but now works on humanitarian issues for a large international organization. 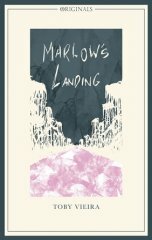 Marlow's Landing is his first novel. Carry on the good work. Well done! Based on this one I look forward to the next one.